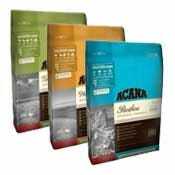 Acana's dog and cat food inspiration and ingredients comes from Canada’s vast and fertile lands providing quality, regional sources always delivered fresh without preservatives and never frozen. 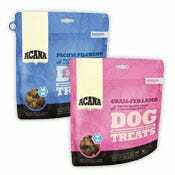 This creates a biologically appropriate, protein-rich formula with various meats just as nature intended! Not to mention the fresh and local fruits & vegetables delivered fresh and fit for human consumption. 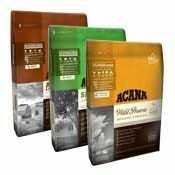 Acana also includes low-glycemic oats as the only grain ingredient from one trusted source in Northern Alberta.